Although healthcare touches everyone at some point in their lives, hospitals are often not thought about until the unexpected happens. The next time you hear an ambulance go by be thankful that your community hospital is here for your needs. We know that you rely on us to consistently provide quality healthcare, and we want to be your choice for care. 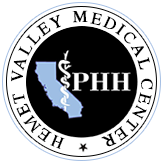 Every day in Hemet our medical professionals quietly go about caring for the health needs of our communities. Lesser known is the contribution we make to the economic health of our community. Our hospital is one of the largest employers in the area, and our hospital staff and physicians are your neighbors, your family, and friends. We are proud of the many excellent clinical programs and services that we offer. Why not let us be your referral source for any medical care needs or information?